I have never really considered myself a fisher or an angler. I remember those few fishing trips when I was a kid where I spent more time untangling fishing line, dealing with jammed reels, worms falling off the hook, etc… than actually fishing. As I grew older, I associated fishing with coolers, folding chairs and almost always staying within site of the parking lot; not very adventurous (in my opinion) and certainly not my preferred way to spend a weekend. 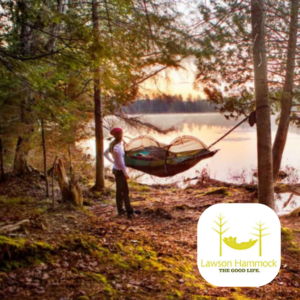 I dabbled in fly fishing, as it always had an aura of romance about it— standing in the middle of a beautiful lake or river effortlessly casting with the wind in your hair and the birds chirping in the trees. The only problem was that it was very complicated and, more importantly, expensive. 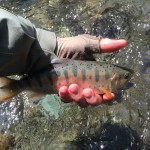 However, my disinclination to fishing suddenly changed when I discovered a “new” style of fly fishing called Tenkara! It had all the romance of fly fishing, but was inexpensive and simple. I was intrigued. While doing my research on Tenkara, I discovered that it has been a style of fishing for centuries (if not millennia). Who started it depends on who you talk to, but there are references to Tenkara in ancient Japanese manuscripts that date back to the 9th century. It’s only “new” here in America, and it’s taking the fly fishing world by storm. When I go fishing I am ready to start within seconds of arriving at the trail head— not so with my regular fly fishing friends. They have to dig through their hundreds of flies, streamers and nymphs as well as choose a certain weight line (which also varies on water clarity and type of fish you want to catch), tippet, leaders, indicators and the list goes on and on. While traditional (aka with a reel) fly fishing has become gentrified and expensive, where you can easily spend over $1,000 to get outfitted, Tenkara is easy to learn, cheap to outfit and ridiculously fun. 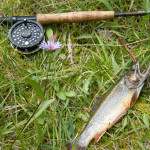 There are several options for getting your Tenkara rod, but Patagonia has a great starter kit. For under $300, you can fully outfit yourself for Tenkara fly fishing. The kit includes either an 8’6”, 10’6” or 11’6” collapsible Tenkara rod, level line, leader, 12 flies, pocket guide and a beautiful soft cover book titled: Simple Fly Fishing: Techniques for Tenkara and Rod & Reel. I picked up the 10’6” rod and kit a few months ago (which I will review in my upcoming article) and I am totally in love with this new style of simple fly fishing. 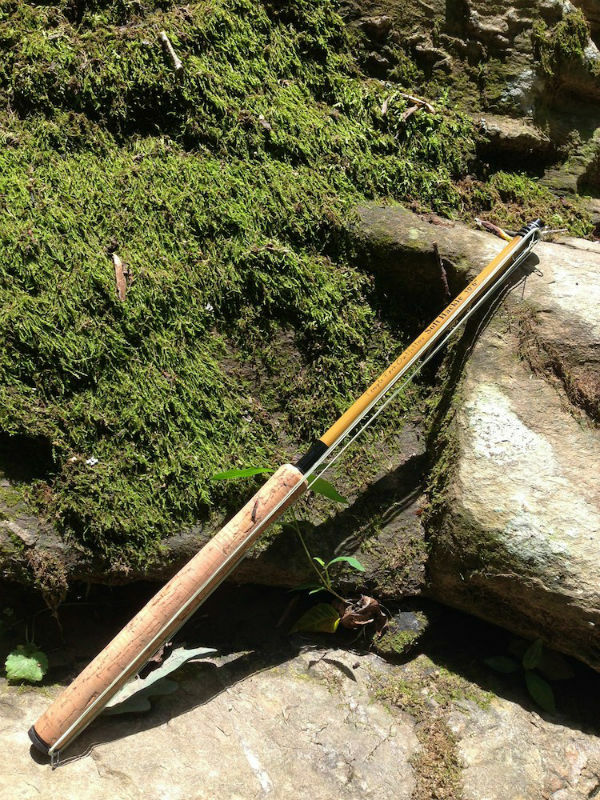 Tenkara is the perfect angling style for backpacking as the rod collapses down and weighs next to nothing. There is no reel, so you fish with a fixed length line which also keeps things very simple and light. 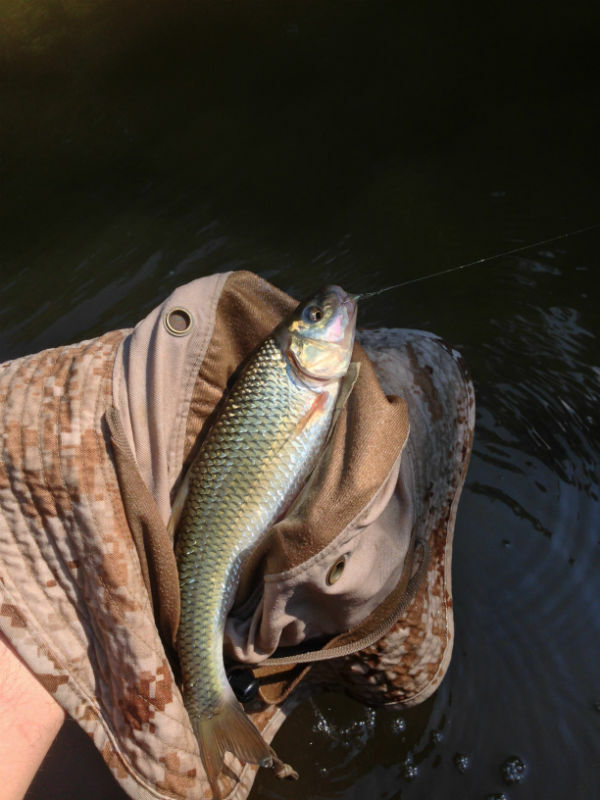 Unlike traditional fly fishing, Tenkara relies wholly on technique rather than switching out one’s fly and line several times a day. I have used the same #12 Pheasant Tail fly over several weeks of fishing and caught well over a hundred fish. From the high alpine lakes of the California High Sierra to the small mountain streams of Maryland and West Virginia, and even ponds and lakes, I only change my fly and line when I lose it in a low hanging tree branch or the belly of a fish. Tenkara is fun. My buddy equated it to playing slots, but much healthier. I have had days where I don’t catch a single fish and others where I have caught dozens, and each day is wonderful and I always learn something new. Tenkara is inexpensive to outfit. All you need is a rod, line, tippet, a handful of flies, forceps (to get the hook out of the fish’s mouth) and a set of line snippers. My tackle box fits in two breath mint tins and I carry a small Gerber Dime multi tool which doubles as my forceps and line snippers. The whole kit weighs 300 grams and can fit into my pocket. Fly tying, while not exclusive to Tenkara, is another great way to save money, learn a new skill and be more self sufficient. I bought a full fly tying kit on Amazon that came with the vise, bobbin holder, English hackle pliers and bodkin for under $30! Throw in a fly tying kit for $15-20 and you can make hundreds of flies, saving yourself a bundle of money in the long run. I have several friends who tie flies during the winter and come spring they have hundreds of flies ready to go for the warmer fishing season! Wet Fly – A fly used to catch fish under the surface of the water. Dry Fly – A fly that floats on the surface of the water. Hackle – The “wings” of the fly. It is the actual feathers that protrude from the body of the hook. As the hook is carried by the current through the water or pulled by the angler, it causes the hook to move and appear lifelike. Nymph – A small fly often with very small or absent hackle. The nymph is allowed to bounce along the bottom of the river by the current, mimicking a submerged insect. Kebari – The Japanese word for fishing fly or loosely translated, “feathered needle.” It is also a unique way to tie a fly with the hackle reversed, which creates a lot of movement and is not designed to look like a specific insect. Level Line – A thicker, heavier line that is often green or yellow. It allows one to cast by putting some weight into the line and is also very durable. Leader – A 6-9’ long line that tapers smaller in diameter. Thick and strong at one end and very fine and hard for fish to see at the other. In days gone by, this was done with strands of horse hair. Tippet – Spooled fishing line that is the same diameter. Pick up a few spools of this stuff and you can recycle your leader when the thinner end is lost in nefarious branches. Indicators – A small bit of brightly colored material that indicates when a fish has struck your line. 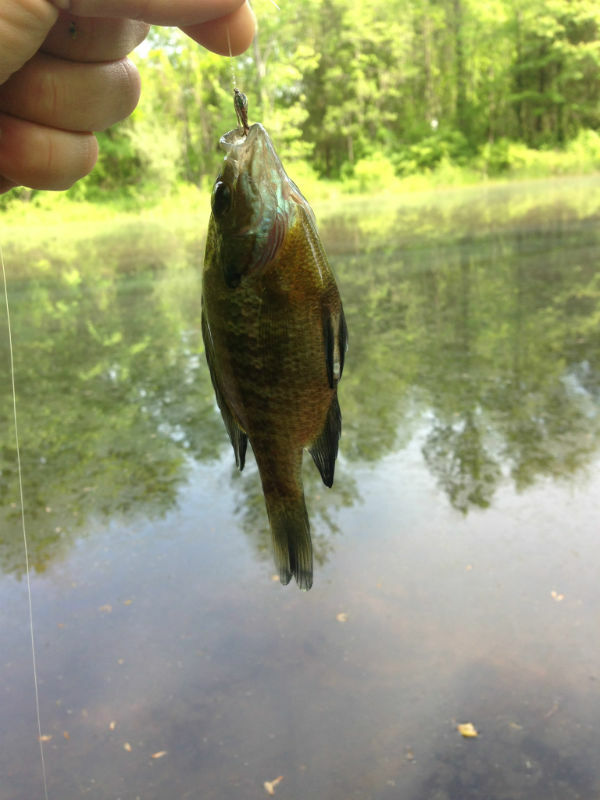 My first fish caught with my new Tenkara rod! The first time I attached the level line and leader to the end of my rod, I had no idea how to get my fly into the water. I am glad that there wasn’t anyone around to witness my early bumblings. But after about an hour of practice, I was beginning to cast effortlessly. Just remember: you are learning a new skill and if you thought you were patient before, Tenkara will teach you a whole new level of patience. 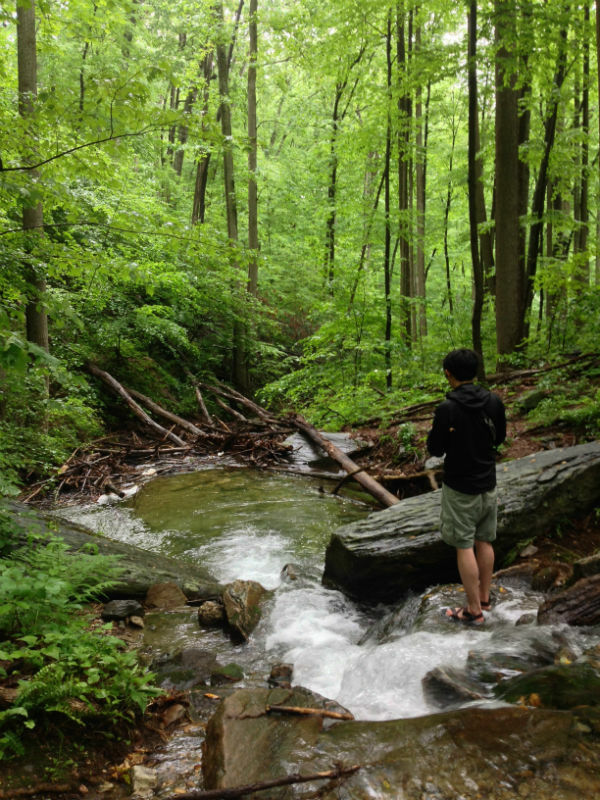 Tenkara forces you to slow down and to enjoy your surroundings in a way you never had before. The peace that transcends your zen-like state is only interrupted by bird calls and the zing of a tight line! Patagonia has a great assortment of Tenkara rods, inspiring stories and great photography. Tenkara USA has an excellent assortment Tenkara gear as well as an awesome forum chocked full of helpful information to assist the budding Tenkara angler. Tenkara Bum has lots of information, reviews and fly tying kits!